One of the traditions I’ve decided to bring back to our home, this Christmas, are the stockings. As each of our kids have grown and married, their stocking has been removed from the fireplace mantel and sent along with them. As a result, only mine and HB’s stockings hang there – and honestly, they look pretty lonely. When I announced my idea to him a couple of weeks ago, his first response was, “Ummm…ok…but do you realize how many stockings we’re talking about here?” He makes me laugh. “Well, of course! Eighteen total…for now!” was my peppy response back. I gotta give props to this guy. For almost twenty-eight years of marriage, he has graciously listened to my requests, big and little, and has done quite an amazing job of making my hopes and dreams become a reality. He went on to ask, “Okay, but how on earth do you plan to hang eighteen stockings from our mantel?” My reply, “I don’t know. I guess I need to search Pinterest!” And off I went, looking up anything I could possibly find to hang A LOT of Christmas stockings. It’s one thing to hang them empty, but you need to have something strong in place that will hold them filled. In years past, I would shove a push-pin into the wall just above our brick mantel, but even those would pull out from the weight of the items inside. Many times, once filled, we would take them down and place them on the floor by the fireplace. So I was on a quest to find something strong and sturdy. I came across some fun ideas, like using those weighted hooks and hanging a curtain rod or tree branch across the hooks. Cute and practical…but even then, I was afraid it wouldn’t be strong enough. 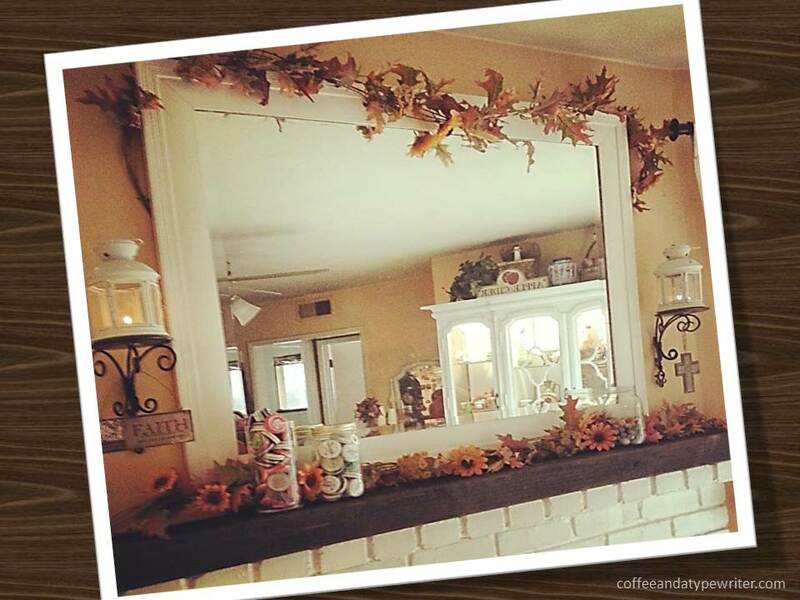 About our mantel…we’ve pretty much hated it from day one. The fireplace is all brick and the mantel is only about 4 inches deep, if that. It has always posed a problem to put anything on top, unless it’s something small. And because we had to paint it all white (we had no choice, the original owners of the house had painted it orange with white in the grout…yeah, I know…very odd…) it’s always been sort of bland and boring, in my mind. After days of searching, Pinterest was kind of failing me for ideas of what to do with my current mantel situation. But I did see some sturdy wooden ones in cabin-type settings and the wheels began to turn. I asked HB, “Do you have any left over wood from the porch project?” He must have seen the wheels turning in my head, because I could tell that he was getting where I was going with this question. He stated he didn’t, but then said, “But, I do have some salvaged posts from the back patio cover that I took down.” At that point, he went outside to search for something that might work. He returned with a long, sturdy and solid 4″ x 6″ post. It was PERFECT! The man loves a good project, so he took some measurements, grabbed the saw and took the wood out back. Because we have a corner fireplace, the angles on the brick are really odd, but you’d never know because he cut it perfectly. This was actually a very simple project for him (made us wonder why we waited so long to do something like this), but wow…amazing results, as far as I’m concerned. I tried to find a “before” picture, but it seems that I never really had a reason to take a picture of it. But, I now have a mantel that is strong and sturdy and will have no problem for eighteen Christmas stockings hung by the chimney with care. This entry was posted in The Simple Life and tagged christmas, faith, family, home, inspirational, legacy, traditions. Bookmark the permalink.